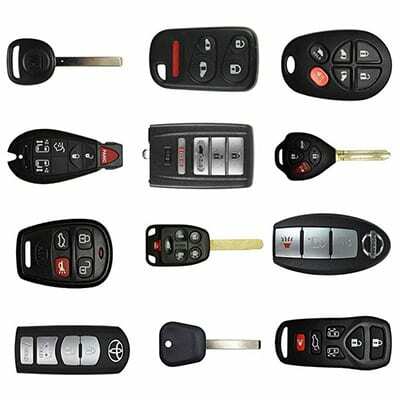 We can replace and program all types of automotive keys including remote head keys, transponder keys, remotes, and key fobs. When you’re looking for a cost-effective, hassle-free way to deal with a misplaced car key, contact us here at Lightning Locksmith. We’re your local Newtown Square, PA lost key replacement specialists, and we offer fast mobile auto locksmithing service you can count on. Better yet, when you call us, your car key replacement cost will be significantly lower than what you’d pay at your automotive dealership, and we guarantee all of our work. As a fully licensed, bonded, and insured mobile locksmith company with over 40 years of experience, we have the skills and specialized equipment it takes to create laser cut keys for any make or model of car, van, or light-duty truck. We offer fast broken key replacement for all kinds of domestic vehicles, including GM key replacement, Ford key replacement, Mazda key replacement, and GM key replacement service. We also offer on-demand, mobile Honda key replacement, Toyota key replacement, and Lexus key replacement throughout Newtown Square, PA. Here at Lightning Locksmith, we know there’s never a good time to lose your car keys or be stuck with a key that’s bent or broken – that’s why we’re available 24 hours a day, 7 days a week to help you get back on the road as quickly as possible. As a fully mobile locksmith, we bring our entire locksmith shop to you, saving you the added expense of having your vehicle towed to a service center. Our mobile service unit is fully equipped with everything that’s needed to create laser cut keys that match manufacturer specs for your particular vehicle. If your key is broken off inside your door lock or ignition, we can extract it in a way that prevents further damage to your car. Better yet, because we come to you, our automotive locksmith will test your new replacement key to ensure it works as it should, and if your new keys need to be programmed to work correctly, we’ll perform that work as well. Here at Lightning Locksmith, we use only premium-quality replacement keys that are designed to meet or even exceed the quality of the keys that were supplied from the vehicle manufacturer. Our laser cut keys are created on a specialized, computer-controlled key cutting unit to ensure a perfect fit with your specific vehicle and prevent problems that can develop when using a low-quality aftermarket car key, such as premature wear to the ignition system of your vehicle. When you need fast, reliable lost key replacement service at a fair, honest price, call us here at Lightning Locksmith. We are proud members of the Greater Philadelphia Locksmiths Association, 1800-Unlocks, Fair Trade Locksmith Directory, and the Associated Locksmiths of America, and we stand behind all of our work. Remember, we’re available 24 hours a day, 7 days a week, and we’ll come right to your home, business, or anywhere else in Newtown Square, PA to get you back on the road as quickly as possible.